Before discussing future projections, let's return to the state of Iowa and look at agricultural trends over the past century. Figures 1 and 2 presented time series of seasonal growing season temperatures and precipitation during the past century for the state of Iowa. 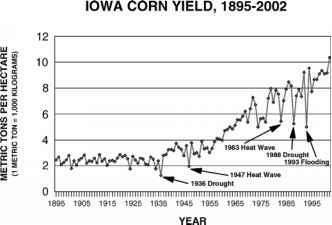 How do they compare with corn yields for Iowa during the same period? Figure 6 presents the time series for corn yields during 1895-2002 for the state of Iowa, revealing some interesting comparisons. First, there are three relatively stable trends in this time series. During the 1895-1940 period, there is no upward trend revealed in the data, with relatively low variability, except in the mid-1930s associated with a prolonged drought. From 1940 to 1970, generally low variability is evident but a substantial increase in trend yields is associated with the introduction of fertilizers, seed hybrids, and better farm management practices. From 1970 to the mid-1990s, the upward trend in yields continues but this period is marked with high variability around the trend yields. Figure 6. Iowa statewide corn yields (metric tons per hectare) for the period 1895-2002. Years of unusually extreme weather events documented. Source: United States Department of Agriculture. severe and prolonged flooding in the U.S. Midwest. This represents a period of extreme weather variability over a relatively short climatic period. While drought and flooding cause significant yield losses as illustrated in Figure 6, untimely heat during critical growth phases can also have a significant negative impact on yields. Corn development is especially sensitive to the weather during the crucial reproductive phase of development. Hot, dry weather during silking can inhibit grain development, reducing the yield potential. The large negative departures from trend noted in 1947 and 1983 were caused by untimely heat waves during the crucial reproductive phase. The impact of these extreme weather events are demonstrated in these charts and illustrate how weather and climate variability are major factors affecting the success or failure of crops in the U.S. Midwest. The potential impact of climate change on agricultural production in the United States and Canada varies mostly by latitude. In the United States, projections based on scenarios from GCM outputs indicate a decrease in yields of all major unirrigated crops based on the premise of increased temperature and reduced crop-water availability. The largest reductions are projected for the South and Southeast. In northern areas, however, where temperature is currently a constraint on growth, yields of unirrigated corn and soybeans could increase as higher temperatures increase the length of the available growing season. When the direct effects of increased CO2 are considered, yields may increase further in northern areas. Some recent climate models are projecting higher expected precipitation due to feedback mechanisms. However, higher air temperatures will increase the rate of evaporation. In some areas, moisture loss may still be greater than the increased projected precipitation. With the relative increase in productivity in northern areas and decrease in southern areas, a major northward shift in land use is implied for the United States. The comprehensive Canada Country Study (CCS), Climate Impacts and Adaptation provides a state-of-the-art assessment based on a range of scenarios from five GCMs developed in Canada, United States and United Kingdom (Environment Canada, 1999). The assessment indicates that an important dimension to the relationship between climate change and agriculture is the wide range of conditions for agricultural production between different regions in Canada. There has been considerable research into the possible implications of climate change scenarios for agro-climatic conditions in all regions of Canada. These studies have considered several climatic change scenarios and have examined the implications of altered climates for wide range agro-climatic properties, including the growing and frost free seasons, and seasonal values for temperature, growing degree days, corn heat units, precipitation and moisture deficits. The implications for thermal regimes have been investigated more thoroughly than the implications for moisture regimes. According to the CCS, all of the global climatic change scenarios and studies suggest warming for most of Canada. Impacts of climate change on agriculture will be most directly reflected through the response of crops, livestock, soils, weeds, and insects and diseases to the elements of climate for which they are most sensitive. Soil moisture and temperature are the climatic factors likely to be most sensitive to change across large agricultural areas of Canada. Longer frost free seasons more conducive for commercial agriculture are expected under climate change. For the Prairies, Ontario and Quebec, most estimates suggest an extension of 3 to 5 weeks. Results relating to moisture regimes show estimated precipitation changes ranging from decreases of about 30% to increases of 80%. The CCS further concludes that despite favorable potential impacts in terms of longer and warmer frost-free seasons and of greater precipitation, most climate change scenarios also imply important increases in potential evapotranspiration. This may lead to larger seasonal moisture deficits in many regions of Canada, with the severest situations anticipated for Ontario. Impacts on agricultural land potential north of 60° are generally considered to be insubstantial in nature. However, the Peace River region and northern agricultural areas in Ontario and Quebec are expected to see some expansion of the land area suitable for commercial crop production. 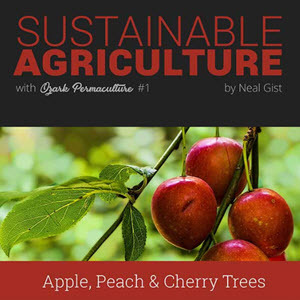 The physical potential for fruit and vegetables could expand beyond current southern locations in Quebec, Ontario and British Columbia, but may be very much limited by lack of suitable soils for agriculture in these regions. Other results suggest largest changes in soil moisture deficits will likely be in the southern prairie regions of Saskatchewan and Manitoba, but results vary somewhat depending on which GCM is used and how deficits are determined. See for example, the soil moisture maps available on the web site of the Canadian Climate Impact Scenario project (CCIS) at: http://www.cics.uvic.ca/scenarios/index.cgi. Computer simulation models have been extensively used for analysis of the complex climate-crop interactions and the assessments of climate change on agro-climate, agricultural resources and crop production. Such studies are important for national and international resource planning because Canada is identified to become even more prominent as a supplier of food with projected climate change (IIASA, 2001). While the agricultural sector of the economy is highly vulnerable to climate change, it is generally felt that agriculture can readily adapt to the kinds of changes that have occurred over the past 100 years or so (Bootsma, 1997). However, projected changes for the next 100 years by the GCMs are substantially larger by at least an order of magnitude than changes that have occurred over the past 100 years. If these projections are accurate, agriculture may experience increased difficulty in adapting to any negative impacts. On the other hand, projected changes in climate could result in longer and warmer frost-free periods across Canada and, thereby, generally enhance thermal regimes for commercial agriculture. The extent to which these changes might benefit Canada, however, will in all likelihood be diminished by less soil moisture in all regions and under all climate change projections (Environment Canada, 1997b). (McRae et al., 2000, p. 72). However, higher temperatures, lower precipitation, and higher wind speeds, associated with climate extremes, would have a negative impact on crop productivity potential. Another important point for consideration of agricultural impacts related to climate variability is the difference between primarily rainfed agriculture and irrigation agriculture. Gadgil et al. (2000) notes that, in rainfed agriculture, yields tend to be lower and there are large fluctuations in yield induced by variations of the environment. In this agricultural system, available resources for input to the system are typically low. In the more mechanized irrigation-based agricultural system, higher-yielding varieties involve large inputs from the farmers in terms of fertilizers and pesticides and from the farmers/government in irrigation of the lands. Consequently, the impact of climate variability typically was reduced by adopting measures such as irrigation. Irrigated agriculture is common in the western United States, relying heavily on winter snowpack in the Rocky Mountains as the principal source of irrigation supplies. Intensive agriculture has been highly successful but heavily dependent on these irrigation reserves. Extreme climate variability and changing climatic trends may have a profound effect in this production system for two reasons. First, if the tendency is for winter precipitation to diminish during this scenario of more extreme variability or climate change, the available supply of water for agriculture will be reduced. However, some GCMs show increased precipitation over winter in the western U.S. for future climate (see, for example, maps available on the CCIS web site: http://www.cics.uvic.ca/scenarios/index.cgi). It is more likely that the winter snow pack may be reduced due to increased melt during winter and more precipitation in the form of rain rather than snow. At the same time, increasing competition for water due to higher population in urban centers and greater demand for hydroelectric power generation compounds the issue of agricultural water supplies. In the long-term, policymakers need to focus attention on these water management issues as they affect all segments of the economy. The environmental consequences of agriculture are strongly influenced by climate. Significant problems other than highly variable crop production include substantial loss of fertile topsoil to erosion; spread of desert-like conditions; water logging, salinization, and alkalization of formerly productive areas; and, flooding and silting due to deforestation. Climate variability and associated extreme weather events contribute substantially to agricultural losses caused by these problems. Thus, agriculture is highly vulnerable to the vagaries of climate.